I just free-handed all of them so some of them were a little oddly shaped, i made well over the amount i needed though so I could pick and choose the best looking ones. I just piped the brown bodies, by the time i was done piping about 60 of them i then filled a plastic zip bag with a very small section of corner cut off with white and started on the eyes. 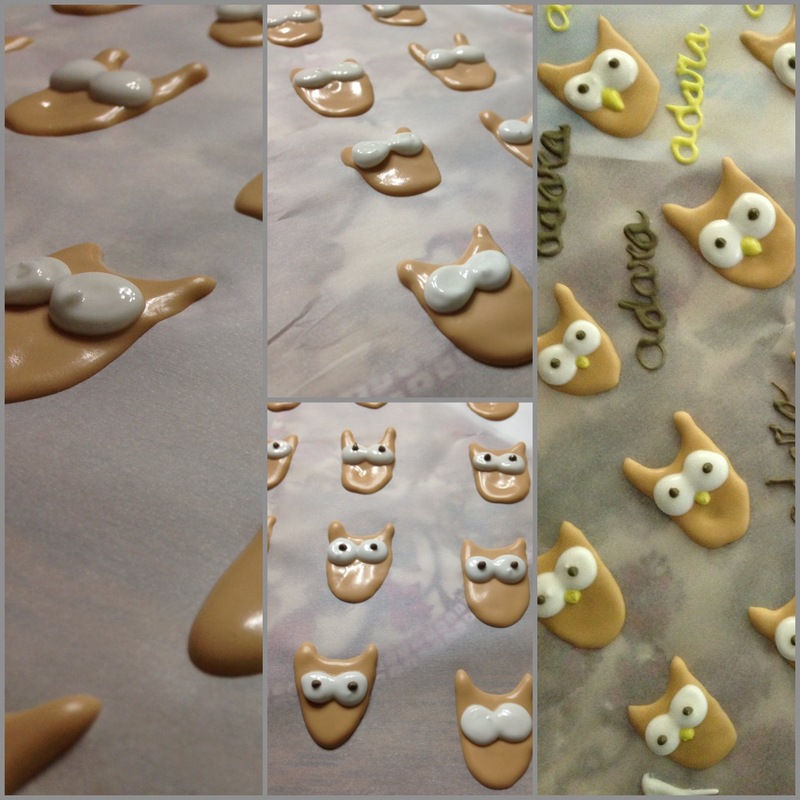 This icing spreads a little bit on its own so i did swirls for the eyes and they spread into nice big and round owl eyes. Then I added some dark brown for the pupil, bright yellow for the beak directly between the eyes and you are done! The whole process took about 30 minutes (plus about 7 to make the icing). The worst part is waiting for them to dry, I let mine dry about 15 hours and some of them were slightly tacky in the middle when i picked them up. You can use royal icing to make just about anything you could imagine. Seriously. There are some incredible people who do royal icing flowers (check them out Here). I cannot wait to try my hand at something a bit more like that! They dry smooth and hard and you can store them in an air-tight container for a very long time! You can add flavors to make them taste however you want and they taste so much better than those store bought sugar stick on decorations…. yuck. Also, check out some gorgeous cookies decorated with royal icing here and here. Place egg whites in a large bowl and beat until smooth and slightly frothy. Add in powdered sugar (start with 3 cups and add more to desired thickness. I wanted mine to be quite thick and not to run so I used 4 cups total), vanilla extract and cream of tartar. Beat for several minutes (about 5) until icing forms soft peaks. Add in desired colors. 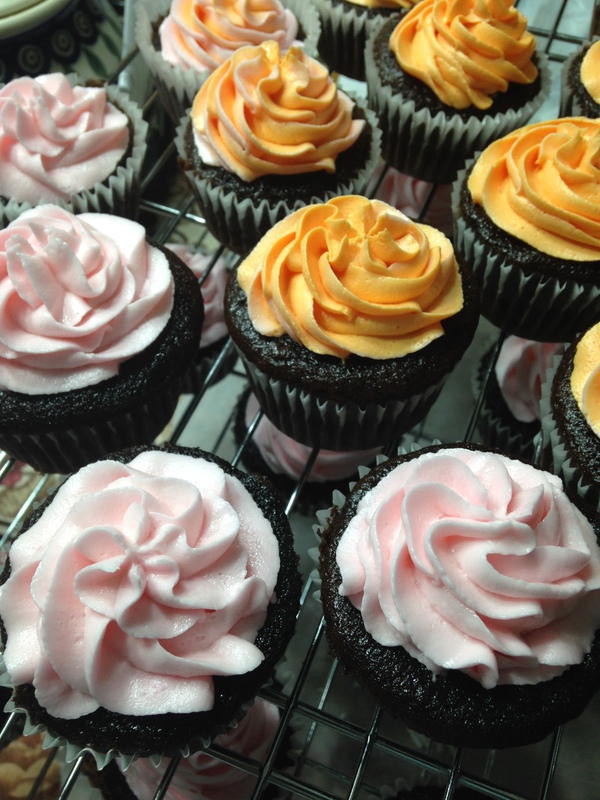 *Only use gel food colorings or else your icing will be too thin and will not hold shape! When not using place a slightly damp cloth or paper towel over the top of your bowl to prevent the top layer from hardening. 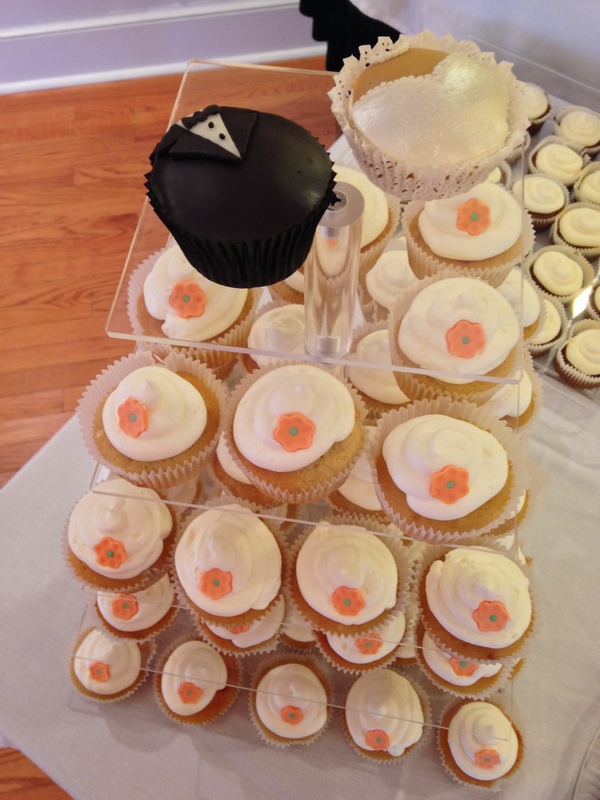 I had the opportunity to make some Bride and Groom cupcakes for a special event this past week. The accent color was purple. They turned out really cute! They were simple chocolate and vanilla flavors and each was topped with a fondant circle, then the other pieces were added to outfit them as a bride and groom! Rebecca and Jeremy wanted to have cute cupcakes instead of a large wedding cake. Some of them were decorated with simple small orange and green flowers they pulled the color scheme from the place they met, Ireland. There were a total of four different flavors that way they could satisfy everyone’s sweet tooth with a flavor they would enjoy. Chocolate, vanilla, red velvet, and pumpkin were the flavors of choice. 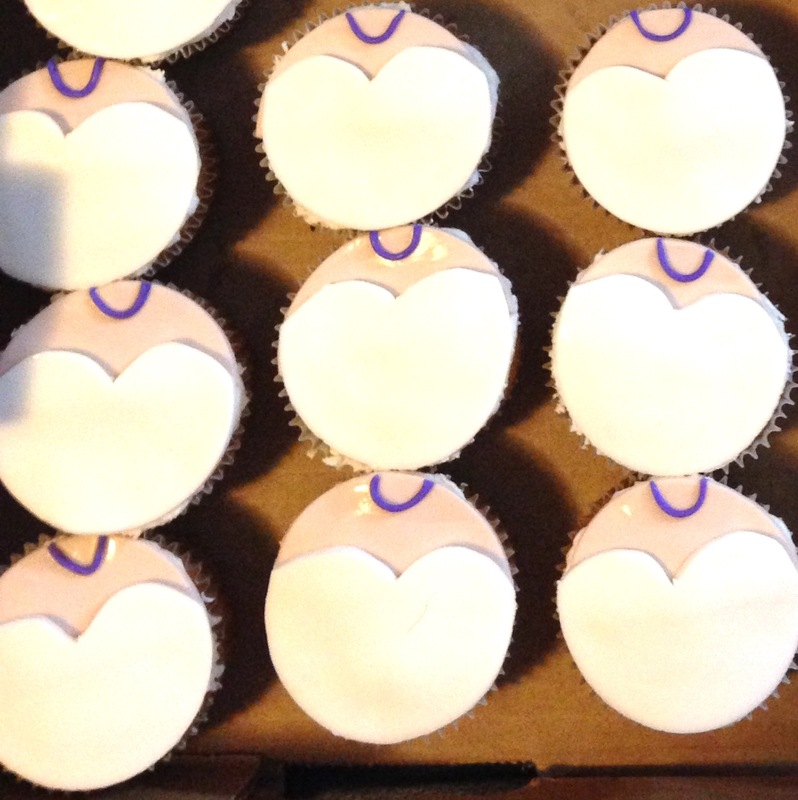 The style was simple with there being only smooth swirls on the majority of the cupcakes. Since they weren’t having a cake they wanted something special for the “topper” and the cupcakes they would do the traditional cake feeding with. 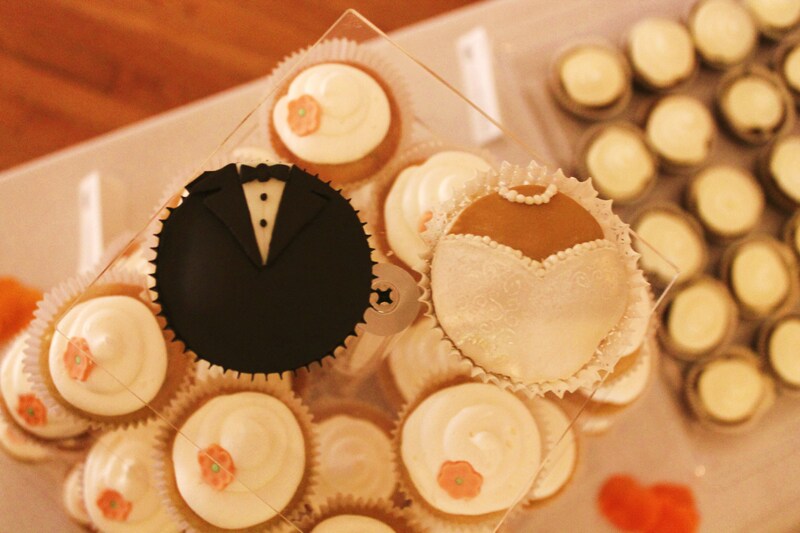 She came up with the idea to do a little tux and dress bust on the cakes to imitate the bride and groom attire. 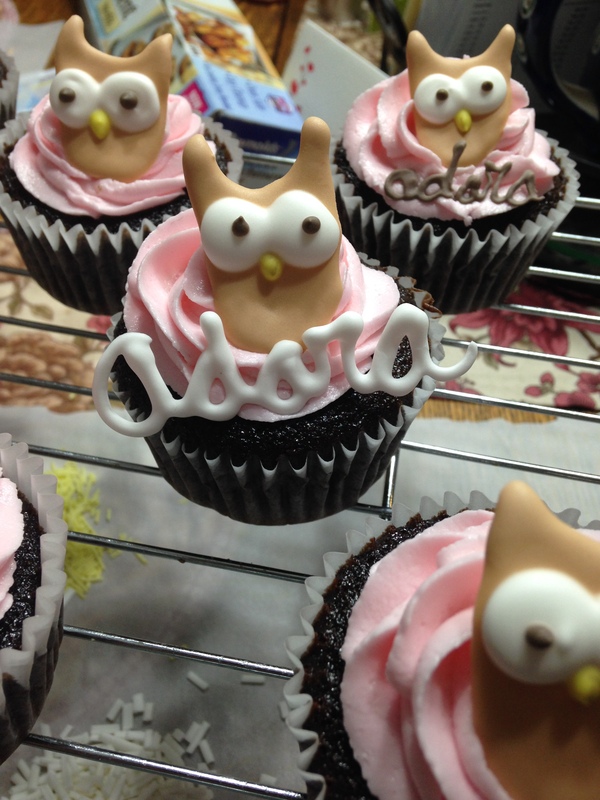 They were surprisingly easy to make and they turned out cute for an alternative topper and top tier. There was only one stand and then the rest of the cupcakes were on clear trays. The cupcakes on the stand were all decorated with a cute little flower to add in some color and break up the simplicity of them. Cupcakes are a really cute and fun alternative to the seriousness of a tiered wedding cake, keeping them simple reduces the overall cost of the cupcakes. They are a great option for anyone who wants something different and fun. My most recent accomplishment was making gum paste graduation caps and white chocolate stars with 2014 written on them. Cutting out those white chocolate stars was a pain! first i melted the chocolate, spread it thin on a piece of parchment, then placed another sheet of parchment on top to make it very smooth. I then allowed it to cool completely and tried my first recommended technique of heating up my cookie cutter and cutting through the chocolate that way…. fail. Luckily i had my handy exacto knife. I used the cutter to make the outline for the star then traced it with the exacto knife and popped it out gently. For the hats i rolled my gum paste out thinly and used the technique described by Glorious Treats. They turned out very cute!